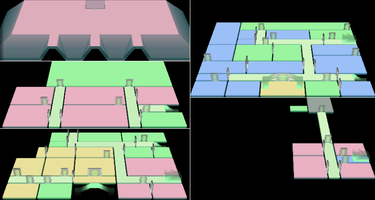 This article is about the Bathroom on the first floor of Luigi's Mansion. For the Bathroom on the second floor, see Bathroom (2F). 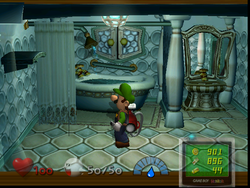 The Bathroom is a room in Area Two in Luigi's Mansion. It consists of a sink with a mirror, a bathtub, and a shelf where the key appears. When Luigi enters the room, he is attacked by two Grabbing Ghosts, a new type of ghost. After both of them are captured, Luigi receives the Key to the Ball Room and a message from Professor E. Gadd, giving him a tip on how to fight off the ghosts. This page was last edited on November 3, 2018, at 16:12.